← Available at your local Co-op: Organic, non-GMO verified Gene-Silenced Food! There is a great buzz about wheat, gluten, and glyphosate (the active ingredient in the herbicide RoundUp) right now. And this buzz is creating lots of confusion and misconceptions. A study concluded that exposure to glyphosate is causing a wide variety of health problems ranging from autism to Parkinson’s to celiac disease, and more. Many have misinterpreted this study to mean that most gluten sensitivities are not caused by wheat and that most people who think they are, in fact are not gluten sensitive at all. Instead their woes are supposedly due to glyphosate. As a result, those who think they are gluten sensitive now are told they can eat organically grown heirloom wheat and can eat any form of wheat abroad where glyphosate supposedly is not as widely used. This is a misstatement of the study. This blog is focused on setting straight the potential relationship between glyphosate and food sensitivities, including but not limited to, gluten sensitivities. The study creating this buzz correlates the increased glyphosate use (currently about 200 million pounds per year in the US alone) with a matching increase a variety of health problems. Correlations are interesting but do not establish causation. For instance, the increased consumer preference for organic food also parallels a rise in diseases but is not a cause of them. Fortunately the study in question does not rely on graphs and correlations alone but also provides additional evidence and reasons why glyphosate likely is a much bigger problem than we have been led to believe. Glyphosate has very little acute toxicity in humans, and, although it is found in breast milk and urine, it does not seem to accumulate in humans. Glyphosate works by blocking the shikimate pathway, a biochemical pathway bacteria and plants rely on to survive. Animal cells with nuclei do not rely on the shikimate pathway for survival. As a result, governmental agencies accepted manufacturers’ claims that glyphosate was non-toxic and set residues and use limits accordingly. Glyphosate does kill plants – all plants. Spray RoundUp on your grass and it will wither as surely as a dandelion would. With the advent of genetic engineering, however, glyphosate-resistant crops were developed so that whole fields could be sprayed, killing everything except the GM crop. These GM crops dramatically increased the use of glyphosate. And because most Americans now are constantly exposed to glyphosate residues on their food, the herbicide is now showing up in human breast milk and urine. While it is quickly excreted, we quickly add new glyphosate to our systems; but again, that is not supposed to matter because it won’t affect us. But glyphosate does affect us. Each of us hosts some 100 trillion bacteria in our intestines and they are critical to our health. If we host the “right” bacteria, they make vitamins (such as B and K) for us and they help us absorb those vitamins. They have many, other varied effects on us and growing the “wrong” ones can cause a variety of health problems ranging from heart disease to depression. A lack of the “right” bacteria inflames our intestinal lining. An inflamed lining can allow parts of foreign proteins to enter our body, causing an immune reaction that manifests as sensitivity to the food that produced that protein. And what does that have to do with glyphosate? Glyphosate kills bacteria and studies are accumulating that show that it preferentially seems to kill our “good” bacteria. Thus, the more glyphosate-containing foods we eat, the more likely we are to develop food sensitivities. Americans today eat a lot of wheat and a lot of dairy. These foods are also relatively new to the human diet. Eaten frequently with a glyphosate-imbalanced intestinal flora easily could lead to a gluten or dairy sensitivity. That is what the study explained. The article also suggests that avoiding glyphosate altogether (by eating organically grown food) will help you not develop food sensitivities. What the article did not say: That once you are wheat sensitive, you can cure the gluten reaction by eating unsprayed or heirloom wheat. Not eating glyphosate will not cure an existing food sensitivity. The article also did not say that the current epidemic of claimed gluten sensitivity is false. It instead suggests that gluten sensitivities (and other food sensitivities) probably are much more common today than in the past because of our glyphosate exposure. 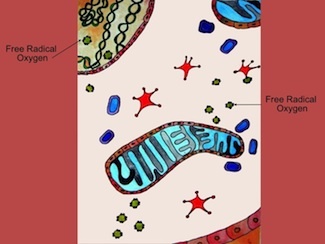 There are other aspects of glyphosate toxicity I am not going to address in detail in this blog but I do want to mention one: Nucleated cells, such as our own, contain organelles called mitochondria that are critical to energy production and oxygen use. These mitochondria are bacteria-like and use the shikimate pathway that glyphosate blocks. This is another reason why glyphosate may be causing a variety of other health issues: It is altering an essential cell function in our bodies. Sugar today is usually produced from either glyphosate-sprayed GM sugar beets or glyphosate-desiccated sugar cane. Very few foods are made with organic sugars so sugar is a real source of glyphosate: From the sugar in your salad dressing, coffee, mustard, ketchup, and pizza to the sugar in your cookies, crackers, and desserts. And then to aggravate matters, the sugar itself favors the growth of the “wrong” microbes while the glyphosate preferentially kills the “right” ones. The solution: Work on avoiding glyphosate. Do not use RoundUp to kill your blackberries or dandelions. Eat organically grown food. Avoid GM foods because they often have a higher residue of glyphosate. And be especially careful with sugars, try to avoid them as much as you can. Testimonials from former students and articles about the TQI Diet also posted on the website. This entry was posted in chemicals, Food and tagged food sensitivity, gluten, glyphosate, GM foods, GMO, intestinal flora, mitochondria, shikamate pathway, sugar cane. Bookmark the permalink. 3 Responses to Is It Really About the Wheat or the Gluten? Samsell A, Seneff S. Glyphosate, pathways to modern diseases II: Celiac sprue and gluten intolerance. Interdiscip Toxicol 2013; 6:159-194. Kathy: I’ve interspersed my comments to Mark’s comments in bold italics. When there’s a correlation of as much as 98% between glyphosate and some of the various diseases mentioned in the study, the fact that it only suggests but doesn’t prove direct causation, in my view, is not a reason to discount the study which it almost sounds like you are doing. I am not doing that at all. I am trying to avoid having people quit reading because they have been convinced that correlation is not causation. More of a ‘give the devil his just due.’ In fact, you & I are in absolute agreement on the problems glyphosate poses. In fact, she readily admits that more study is indicated. And while, as you say, it is true that an increased consumer preference for organic food, parallels a rise in diseases but is not a cause of them, it probably does suggests that the rise in diseases might very well be the cause of increased preference for organic food. For it suggests that a lot of people and/or their health providers believe that there’s something wrong with the average American diet that might be causing disease and/or by changing their diet they might avoid those diseases or help cure them. My take after conversing with Seneff and reading the Swanson study, is that the correlations are highly suggestive of causation. An awful lot of the foods that Americans eat contain glyphosate although, your clients probably eat less than most Americans do. But if all the people who can’t afford organic food decide all of a sudden to change their habits and eat organic food, which they probably should, we now would be in one hell of a mess. So this is a pretty serious problem and the implications are staggering. We need to look at at the big picture here. Actually, if everyone began eating the amount of vegetables I recommend, we’d be in a pickle. Not enough is grown. If everyone decided they needed to avoid glyphosate I suspect a “glyphosate-free” certification would appear, much as non-GMO verification has. I look forward to reading that!.